Most hailstorms last three to five minutes. In that time, Mother Nature can deal a crushing blow to your crops, your profits, and the future of your farming operation. Remove that risk today with Crop Hail coverage from Pro Team Insurance. 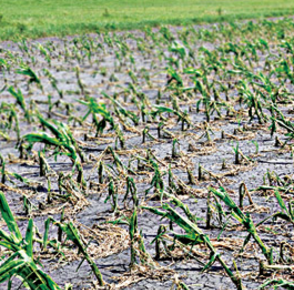 Crop Hail coverage provides protection against physical damage from hail and/or fire. Most Pro Team Insurance hail policies include extended coverages like fire and lightning, vandalism and malicious mischief, and certain perils while in transit and storage at no additional cost to you. The catastrophe allowance will apply to all losses that exceed 70% of the particular acre or acres of crops, and is figured at a rate of .5% for every 1% of loss exceeding 70%. In no event shall the total payment per acre exceed the amount of insurance applying. A policy in which a 10% deductible and full coverage policy are built into one. One-half the coverage will be at full and one-half the coverage will be at the 10% deductible. At 50%, the deductible disappears and the policy becomes full coverage. The Company shall have no liability for loss to any acre of crop until loss or losses exceed 5%, and then the Company shall have liability for 1.25 times the percent of loss in excess of 5%, once the percent of loss equals or exceeds 25%, this provision no longer applies. The Company shall have no liability for loss to any acre of crop until loss or losses exceed 10%, and then the Company shall have liability for 1.25 times the percent of loss in excess of 10%, once the percent of loss equals or exceeds 50%, this provision no longer applies. The Company shall have no liability for loss to any acre of crop until loss or losses exceed 10%, and then the Company shall have liability for the percent of loss in excess of 10%, except that when the percent of loss exceeds 20%, the Company shall have an additional liability for 2.00 times the percent of loss in excess of 20%. This provision does not apply for losses greater than 25%. The Company shall have no liability for loss to any acre of crop until loss or losses exceed 20%, and then the Company shall have liability for the percent of loss in excess of 20%, except that when the percent of loss exceeds 30%, the Company shall have an additional liability for 2.00 times the percent of loss in excess of 30%. This provision does not apply for losses greater than 40%. The Company shall have no liability for loss to any acre of crop until loss or losses exceed 30%, and then the Company shall have liability for the percent of loss in excess of 30%, except that when the percent of loss exceeds 40%, the Company shall have an additional liability for 2.00 times the percent of loss in excess of 40%. This provision does not apply for losses greater than 55%. The Company shall have no liability for loss to any acre of crop until loss or losses exceed 20%, and then the Company shall have liability for 1.25 times the percent of loss in excess of 20%. The Company does not cover loss until the percent of loss per acre exceeds 15%. The percentage per acre then payable shall be the percent in excess of 15%. Once the percent of loss exceeds 70%, an additional 1.5% shall be paid for each percent in excess of 70%. The payable percentage may not exceed 100%. The Company shall have no liability for loss to any acre of crop until loss or losses exceed 20%, and then the Company shall have liability for 1.40 times the percent of loss in excess of 20%, except that when the percent of loss equals or exceeds 70%, this provision no longer applies.